When it comes to talking to your kids about divorce, get help from parenting experts and experienced writers. These eight children’s books help you talk about divorce in age-appropriate, gentle ways. Divorce affects children in many ways. As you work through your own emotions, get help talking to your kids. 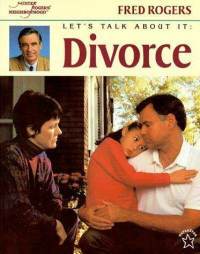 Children's books about divorce translate the difficulties of divorce into messages that little ones can easily digest. Share these books with your kids and you might find yourself comforted as you read aloud. Fred Rogers of Mister Rogers' Neighborhood was beloved for his ability to communicate honestly and appropriately with young children. This no-frills book doesn't talk down to kids at all. The stock photography helps kids identify with emotions as you read Let's Talk About It: Divorce aloud and share how divorce affects young lives. Don't cringe at the title of this picture book. This book for elementary-aged kids talks about the ins and outs of divorce. 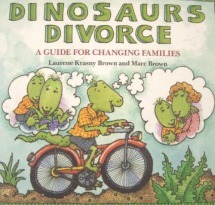 Because Dinosaurs Divorce by Marc Brown addresses remarriage and dating, it may not be best for kids who are experiencing the earliest stages of separation and divorce. Check out a copy at your local library to get an idea if this is a good fit for your family. 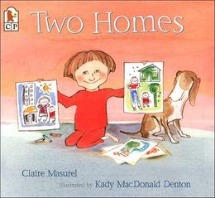 Help your little one understand the changes in her life by sharing Two Homes by Claire Masurel. 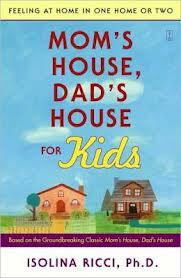 This very simple, positive book focuses on the good parts of having two homes. Perfect for little ones who are adjusting to mom and dad separating, this picture book is a must-have to share with your co-parent. 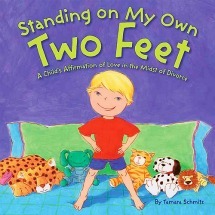 If you're looking for a positive book on divorce, Standing on My Own Two Feet by Tamara Schmitz is one of your best bets. Perfect for preschool kids, this picture book empowers kids to cope with the life changes that affect them because of divorce. The messages are very simple and honest, such as teaching kids that mom and dad may not get along anymore, but it's not their fault. 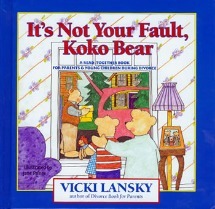 If your young child is struggling with your separation or divorce, It's Not Your Fault, KoKo Bear by Vicky Lansky will help validate her feelings. KoKo bear has not yet accepted that she/he will have two homes. This simple book speaks to kids ages 3 and up, but due to length may resonate more with kids closer to 5-8. Written by a psychotherapist, My Family's Changing is a picture book on divorce that urges kids to engage in introspection. 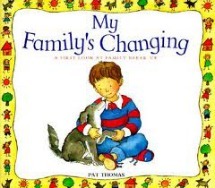 If your child is having difficulty processing the reality of divorce, this book by Pat Thomas will be a good tool to read aloud and use as a foundation for further discussion. If your child is too old for picture books but isn't quite a tween, Mom's House, Dad's House for Kids: Feeling at Home in One Home or Two is a wonderful book for communicating about divorce. Perfect to read aloud with your older child, this in-depth book by Isolina Ricci address early divorce as well as future issues like remarrying. Keep it on hand as a tool to guide your children through the long process of co-parenting through divorce. Hey Mom and Dad, Remember Me? Teens and tweens are just as affected by divorce as young kids. They experience the loss and grief in different ways. Hey Mom and Dad, Remember Me? by Dr. Durlynn A. Anema helps adolescents cope with the feelings associated with separation and divorce. This longer, handbook-style tool is a book you can read first and then give to your tween so that she can read at her own pace. What's on your child's emotional wishlist? Could your tween be depressed? Should I bring my child to a funeral?